Chisel sharpening information and recommended chisel sharpener products. Includes video on how to sharpen chisels and written guide to sharpening new and used chisels. Applicable to wood chisels and other woodworking tools. When sharpening a new chisel you are going to need to flatten the face before you sharpen the bevel. This is done by lubricating an extra coarse diamond bench stone (Diamond Whetstone™, Duo-Sharp® & Dia-Sharp® models available) with water and placing the back of the chisel down on the sharpener. Push downward on the face and move the chisel from one end of the diamond stone to the other with long fluid strokes (see illustration below). Next, use the coarse grit stone and step down through the grits, ending with extra fine. Use the same procedure as with the extra coarse stone. After all the diamond grits have been utilised, you can step down into the Dia-Paste™ diamond compound to achieve a mirror finish. Now we're ready to sharpen the bevel of the chisel. Put your thumbs under the blade and your fingers on top (see the video below for an illustration of this). Using your hands in this fashion gives you a makeshift jig. Make long fluid strokes back and forth, pushing the blade downward onto the stone. Use a fine grit diamond sharpening stone unless the blade is very dull or chipped, in which case start with a coarse grit. After sharpening the bevel you may want to put a micro bevel on the end of the blade. This is done by holding the chisel in the same manner and matching the bevel to an extra fine stone. Now lift the chisel up a small amount to an angle of about 1 or 2 degrees greater than the bevel. Only a few strokes and you have a sharp micro bevel. Finally, lay the face down flat again and give two quick strokes to take the wire burr off the bevel edge. Interrupted diamond surface with recessed holes that collect the metal bits during sharpening, preventing loading and making sharpening fast, easy and clean. Available in 6in & 8in models. 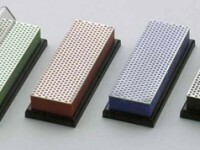 Double-sided, innovative sharpening stones. Precision-flat, two-diamond sharpener, guaranteed to provide consistent, even sharpening every time. Interrupted diamond surface. Available in 8in & 10in models. For users who prefer a continuous diamond surface or must sharpen small or pointed tools. Available in the widest array of sizes and grits, including extra extra coarse & extra extra fine. With non-skid rubber feet. Available in 6in, 8in, 10in & 11.5in models. >> Buy a DMT Dia-Sharp® continuous diamond bench stone! >> Buy a DMT Diamond Whetstone™ interrupted bench stone! >> Buy a DMT Duo-Sharp® double-sided interrupted diamond stone! 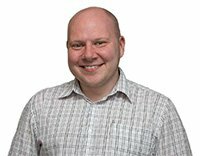 Diamond Grit Types - Which to use? By working through the DMT® system of progressively finer grits, you will quickly achieve a razor sharp edge on quality knives and tools. 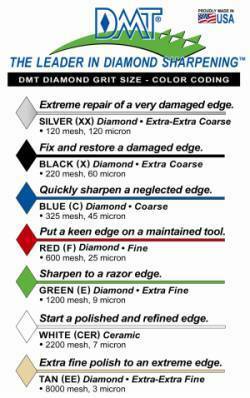 The DMT® diamond products are colour-coded for identification. In our product descriptions, coloured diamond shapes denote the specific grits in which each model is available. Which grit you should use depends on... How often do you sharpen? How dull do you let your knife or tool edge get before you re-sharpen it? How sharp is sharp enough for you? Ask yourself these questions, and then read the grit descriptions (left) to determine which grit(s) best suits your needs. Hint: the pros use more than one grit & move from coarser to finer grits as they sharpen. If you have any questions about sharpening chisels then please don't hesitate to contact us. You can email us at sales@buybrandtools.com. Or you can call us on (0114) 251 3535 - Monday-Friday (8.45am-5pm).